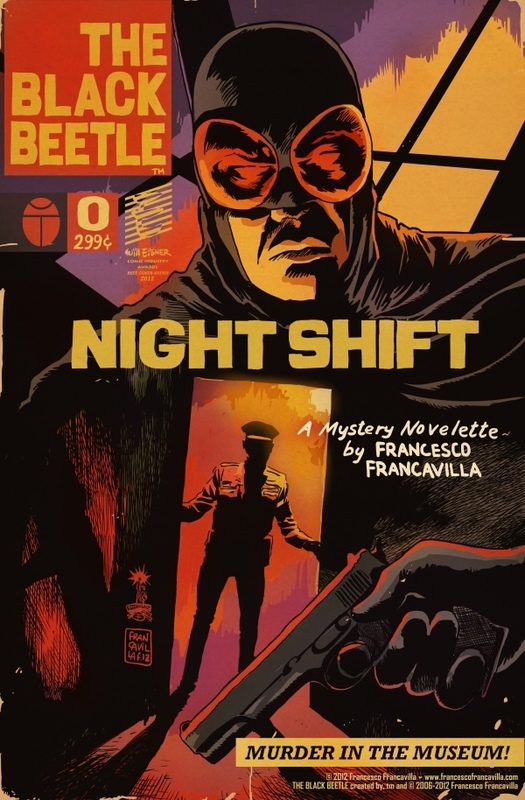 You might remember the title character as The Black Beetle originally appeared in the pages of Dark Horse Presents with a three part tale called The Night Shift. If you haven't read it, don't worry because that story will be collected into the first issue of Black Beetle's new ongoing series this December- starting with The Black Beetle #0. You won't find just the 24 pages of reprints in #0 though, the issue will also feature new sketchwork and art as a little bonus to get things started. As far as classic superhero pulp goes, the stories planned for following issues of the book sound fantastic. I could definitely imagine The Black Beetle being a character that debuted years ago- when the comic industry was young and just getting it's legs. Each issue will also feature a 'letters page' that'll be addressed with answers and comments right from the character's creator himself- Francesco Francavilla. The Black Beetle brings a fresh take on two-fisted action to comic shops everywhere on December 19th from Dark Horse Comics.